Local recruitment agency – THE Agency (Recruitment) Limited based in Cleckheaton is delighted to announce the winner of their Temporary Worker of the Year 2015. Carol Davie who has worked for THE Agency for almost 3 years has proved to be an invaluable member of their temporary team at one of their Clients – Morrisons Supermarkets Plc in Gain Lane Bradford. Kim Barnes – Evans FIRP (Managing Director) says that “Carol is a ‘model’ Temporary Worker who has without doubt proved herself over and over again whilst working for THE Agency. Carol has worked for 5 different teams whilst at Morrisons and has brought huge value to each area of the business that has been fortunate enough to have her on their team”. Kim goes on to say that “Carol originally approached THE Agency in October 2012 looking for short term temporary work after being made redundant and has been with us ever since. Neither of us have looked back and we have built up a very strong working relationship – we also consider Carol to be a good friend to all of us at THE Agency. Carol is renown for her tenacity, her meticulous attention to detail, her ‘can do’ attitude and also everyone knows that she will exceed any expectations that are given to her. Carol is an absolute star and has an excellent attendance record – so much so that we have to remind her that she does have to take holidays – otherwise we know she would just work the whole year without thinking of take a day off! It is very rare to find a Temporary Worker that is so consistent for such a long period of time and after almost 3 years of working with Carol, she still applies the same amount of vigour and enthusiasm that she did on her first weeks with us. She is a unique lady with a warm and very friendly disposition and we feel very proud to be making this award to Carol! 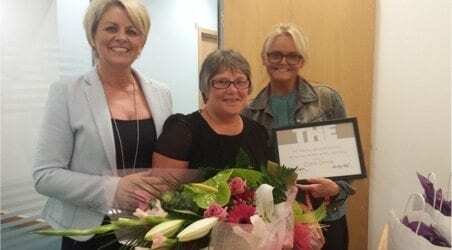 She is a very dedicated lady and that is why when you consider all of the elements that warrant such an accolade as Temporary Worker of The Year then Carol ticks all of the boxes for us. We are very grateful that she chose our agency all those months ago”. Carol was awarded with a certificate, a bouquet of flowers, £100 M&S Vouchers, wine, chocolates and a selection of agency promotional gifts as a thank you for all her hard work and loyalty to THE Agency. Picture Left to right: Kim Barnes – Evans FIRP (Managing Director), Carol Davie (THE Agency’s Temporary Worker of The Year 2015) and Jo Whitley (Systems and Quality Administrator at THE Agency).